Rogue's Home is the second book in the Knight and Rogue series by Hilari Bell. Available at Amazon and Barnes and Noble. I've read and reviewed the first book in this series, The Last Knight. Sir Michael Sevenson and his squire, Fisk, can't seem to keep out of hot water. After five long years, Fisk has been called home to Ruesport to investigate who framed his sister Anna's husband, Max, as a blackmailer. Anna figures that Fisk, with his criminal past, is uniquely qualified to find out who set Max up. Of course Michael feels he has to come along to help his friend; but now he wears the tattoos of the unredeemed and fears he might be more hindrance than help. 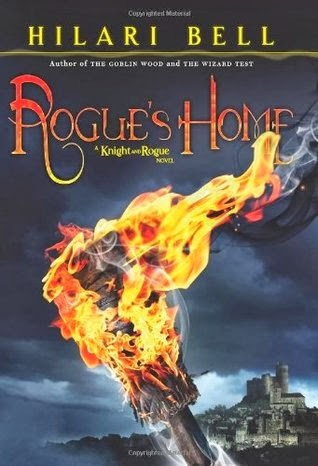 As in The Last Knight, Hilari Bell's first Knight and Rogue novel, Rogue's Home combines the banter of a buddy story with elements of classic fantasy, medieval derring-do, and mystery. Michael and Fisk are likable guys who just seem to he magnets for trouble. You never know what is going to happen to these would-be heroes next. Noble-Sir Michael the knight errant becomes one of the unredeemed and loses his noble title while his squire Fisk, released from his debt, is a freeman called home to save his family, giving us the details about Fisk's past hinted at in the first book. The story is two-person point of view like the first book. It was easier to keep the narrators straight as we see Michael cope with the effects of his new tattoo that mark him as unredeemed while Fisk, reunited with his family, blossoms. The world they live in is again delivered in tantalizing pieces giving readers just enough information to form questions. It's almost like a book within a book - at some point, these details will be important, just not right now. That makes me eager to read the next installment in the series.